In a study that began in 1978, recent data has shown that entrepreneurship in America has reached its lowest point within the last 30 years. According to the Washington Post, business data via The Brooking Institution correlates with the slow economic recovery of this nation. For more information check out this link. For major cities in America this type of trend is becoming increasingly common. Major stores such as Wal-Mart are putting “mom & pop” stores out of business. 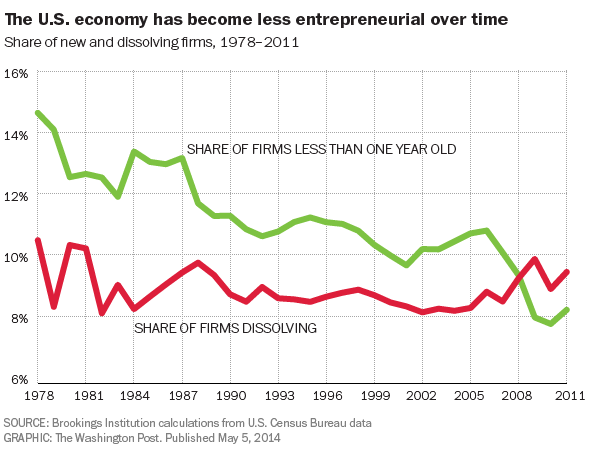 In fact, major corporations are now making it increasingly tough for their competitors as well. Unless the government intervenes, the U.S. will continue to suffer from these major corporations’ actions. Going overseas for cheaper labor yet selling mass produced items will inevitably hurt society in the long run.